AgX offers a variety of workshops that are open to the public. 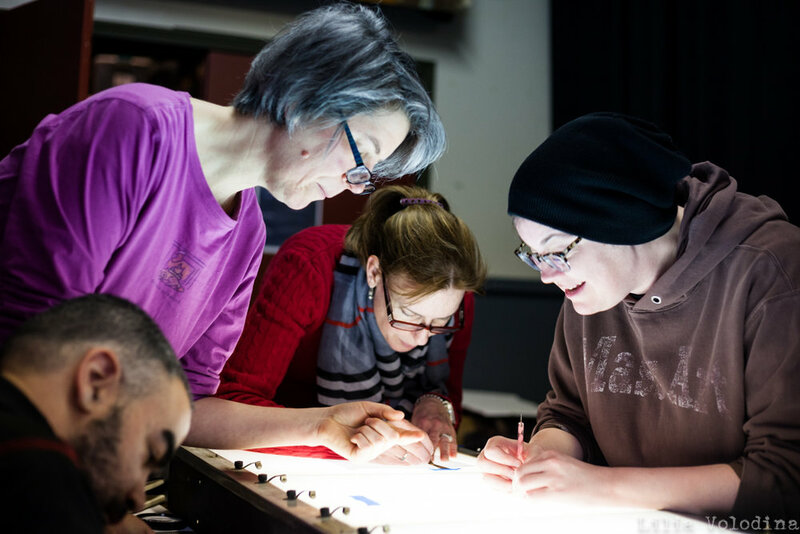 Here students huddle around a light table to paint on film during our Direct Animation Workshop. Image from AgX Members installation at the Waterworks Museum. Members learn to repair broken equipment and projectors at our Repair Workshop. AgX members project onto City Hall during HubWeek. Members on a Field Day at Peddocks Island where beginner and veteran filmmakers share skills and shoot film together. AgX is an artist-run film lab and collective for moving image artists in the Boston area. We share resources, equipment, camaraderie and knowledge with a focus on the creation and appreciation of photochemical films. Sign up for our newsletter.